18" Rainbow Glow Lamp - A brand new item! The perfect addition to any bedroom, living room or party space. Turn this lamp on and set the mood. This lamp is soft and soothing. Looks best in complete darkness. "This is not an expensive gift, it is a gift that is a little bit retro and a whole lot,’right on!’. 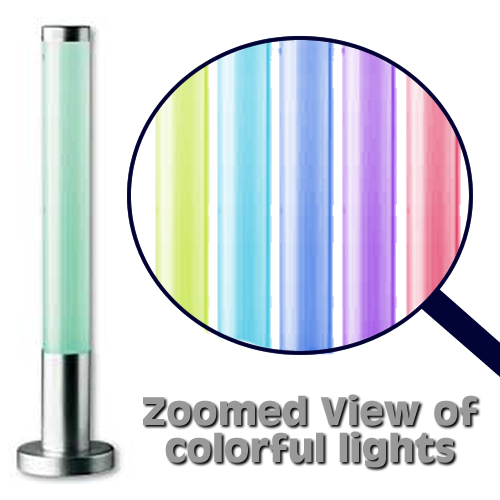 I gave this Rainbow Glow Lamp to my adult son, and he thinks it is fantastic! The design is modern and sleek, with dancing lights that are as colorful as they are total entrancing. You choose the modes that you want your lights to dance to, trickle to, just stream down and up to. You choose exactly how you want the lamp to glow, and the colors are fantastic! It is easy to operate. You press it on. You press to change the mode/pattern of the lights, and you press it for a longer period, and it will turn off. This is a gift that any child or adult will enjoy. It is not just for females or just for males. It is the perfect gift to keep in your gifting shelf for when you need an instant gift for someone. It is great for any occasion! It makes a great family gift for the people you can’t afford to spend too much on, but, want to get the family something nice. This IS nice. I totally recommend this as a great gift for now, or for keeping on hand. Try it! See how you become so mellow with the pastel lights going in the mode YOU choose! It works at our house!"